Set of 4 Barware On the Rocks beverage glasses custom engraved with monogram. These classic Double Old-Fashioned Rock Glasses will be sure to add a handsome touch to your barware collection. Simple enough for everyday use while serving yourself or your guests. 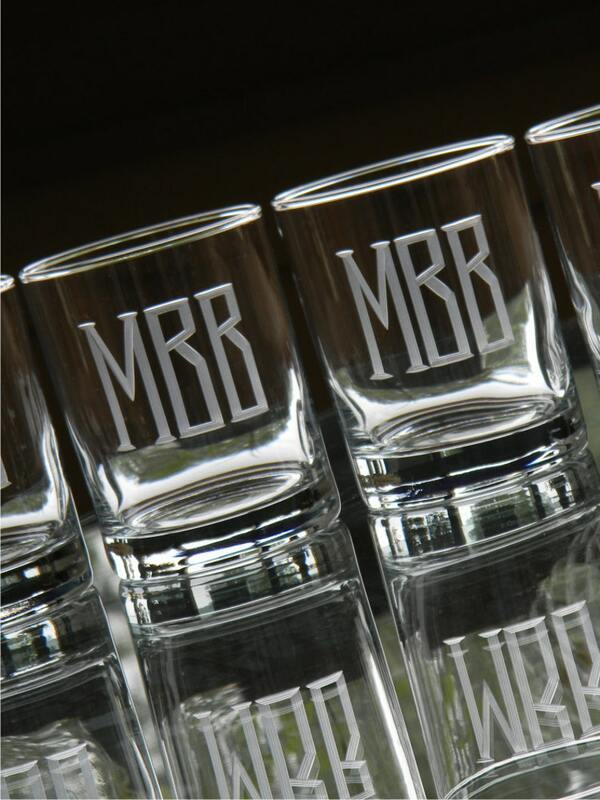 The hand engraved initials add a personal touch to these cylindrical shaped all-purpose glasses. Great gift for groomsman, a new home celebration or bring a set to the host of your next dinner party. Thrilled with the depth of the monogram and weight of glass. Gave my husband set for Christmas and 1 set to his Single Malt sipping buddy. Both “ boys” were thrilled, as was I! Will shop again. Beautiful glasses! This was my second order, and I am just as pleased! High quality and consistently fast service! Set of 2 MR and MRS Beverage "On the Rocks" Tumblers. The glasses arrived just like I ordered and in time for Christmas! I ordered the stacked monogram for my brother in law and it looked very masculine. Great product! !